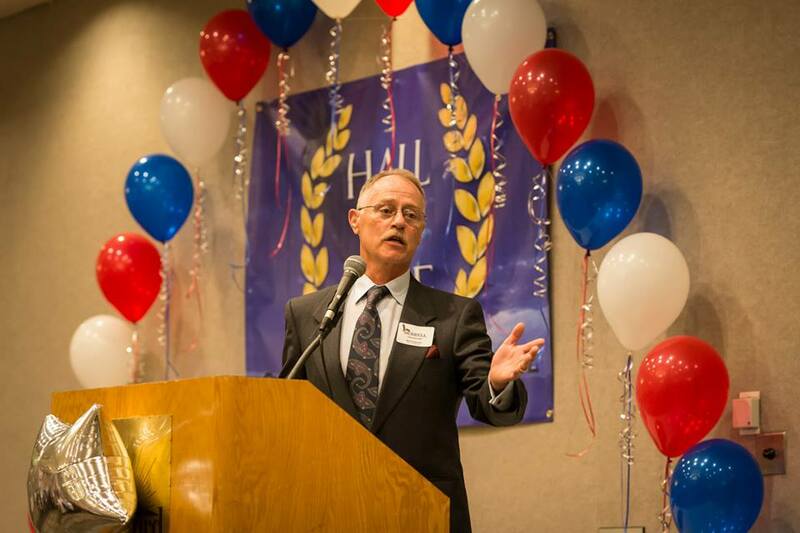 As Clayton Valley High School celebrated it’s 50th anniversary in 2008, a group of inspired individuals also created the Athletic Hall of Fame to honor outstanding CVHS boy and girl athletes of the past. “People have talked about it for years but no one got around to it”, said former CVHS athletic director Dee Billeter. “The 50th anniversary seemed like a good time to finally do it”. Now, in 2018, the HOF Committee is launching a web site to commemorate Hall of Fame inductees – that includes athletes, coaches and individuals from the community who have contributed to the success of the CVHS sports programs. The first induction took place on Saturday, October 18, 2008 at the Oakhurst Country Club in Clayton. The idea for the Hall of Fame had been brought forward a year earlier when CVHS athletic director Pat Middendorf approached Dee Billeter and another former CVHS athletic director Bill Nelson, and asked them to bring the Hall of Fame together. It was decided that the HOF would initially focus their attention on athletes from the schools earlier years and gradually move to include more recent athletes. This was a lengthy process for Billeter and Nelson that required them to go through every yearbook from the 60’s and 70’s to identify and select the top athletes. A committee of former CVHS coaches and teachers from those decades was formed to help narrow down the list and help choose the final inductees. Among notables inducted in that first ceremony were Clyde Mashore, who was drafted out of high school to play for the Cincinnati Reds; Ron Coccimiglio, a 1976 graduate who was an all Pac-10 selection for UC Berkeley; Bill Smith, an Olympic Gold Medalist and coach of the wrestling team that won seven Diablo Valley Athletic League titles from 1977 to 1983, North Coast championships in 1977 and 1978 and a California State title in 1977. In 2013, Clyde Mashore’s sons, CVHS multi-sport athletes Damon and Justin were inducted into the HOF. In addition, a number of championship ‘teams’ were also inducted at that first and subsequent ceremonies. The 1959 Cross Country team was inducted in 2008 making them the oldest members of the Hall of Fame. Another important team induction took place in 2010 when the girls ‘Pioneers’ team was inducted. This induction is a tribute to the girls club sports in the 1960’s and early 1970’s. Girls sports were then referred to as GAA (Girls Athletic Association) prior to the establishment of the Diablo Valley Girls Athletic League in the 1970’s. The Pioneers include members of all GAA sports of the era including volleyball, basketball, softball and field hockey with more sports being added every year during this period. Pioneer notables include Karen Kaiser, ’70, who teamed with her CVHS basketball coach Karen Johnson (2008 HOF) as players in the original San Francisco Warriors Professional Basketball League in the early 1970’s. At that that first ceremony many of the inductees expressed their appreciation to their former coaches and teammates for the positive impact that being a Eagle had on the high school careers and the later lives and careers. Inductees also talked about the affect that the HOF will have on current CV student-athletes. “Kids will now see what’s been going on in the past years” said Clyde Mashore, “It will inspire them to be better and see what an honor it is to be in the Hall of Fame”. Additional athletes have be added in ceremonies held in 2010, 2013, 2015 and 2017. All inductees and biographies can be found at the “Inductee” section of this web site.